Papergreat: Walt Disney presents Upton Sinclair's "The Gnome-Mobile"
Walt Disney presents Upton Sinclair's "The Gnome-Mobile"
As a child of 1970, I'm relatively familiar with the Disney movies of the 1960s and 1970s. But I must admit that, until I ran across this silly-looking thing at the comic-book shop, I had never heard of The Gnome-Mobile, in any form. Clearly, it was no Darby O'Gill and the Little People. Amazingly, it began as a novel by muck-raker Upton Sinclair. 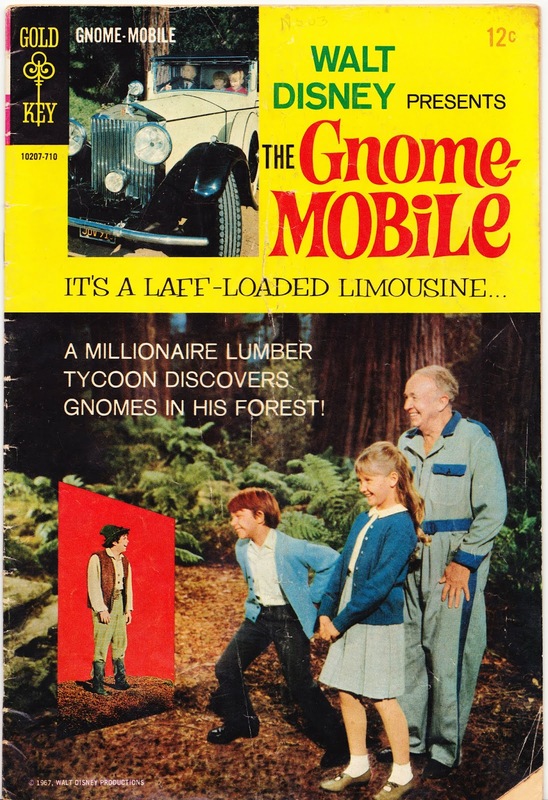 In 1936, he published The Gnomobile: A Gnice Gnew Gnarrative with Gnonsense, but Gnothing Gnaughty, which might just be the worst extended book title of all time. It is described as "an amusing tale of two gnomes, Glogo and Bobo, who travel to America in the company of two human friends in their custom gnomobile" and described by Goodreads reviewer Emily as "kind of lame." But another reviewer, Kookie, calls it "delightful and weird with a still important environmental message." The movie plot involves a Rolls-Royce, precocious grandchildren, endangered gnomes, a quest for a gnome bride, a freak show, an asylum and an Important Message about preserving our forests as a haven for mythological creatures that don't actually exist. So, standard Disney fare. Imdb.com reviewer Jimina Sabadú opines: "I think this is much better than 'Lizzie McGuire' and all that 'princess Disney' stuff and things like that. At least, a movie like 'The Gnome-Mobile' does say something, not just 'Hey! Be cool and buy clothes' when you read between the lines." It's hard to argue with Jimina on that point. 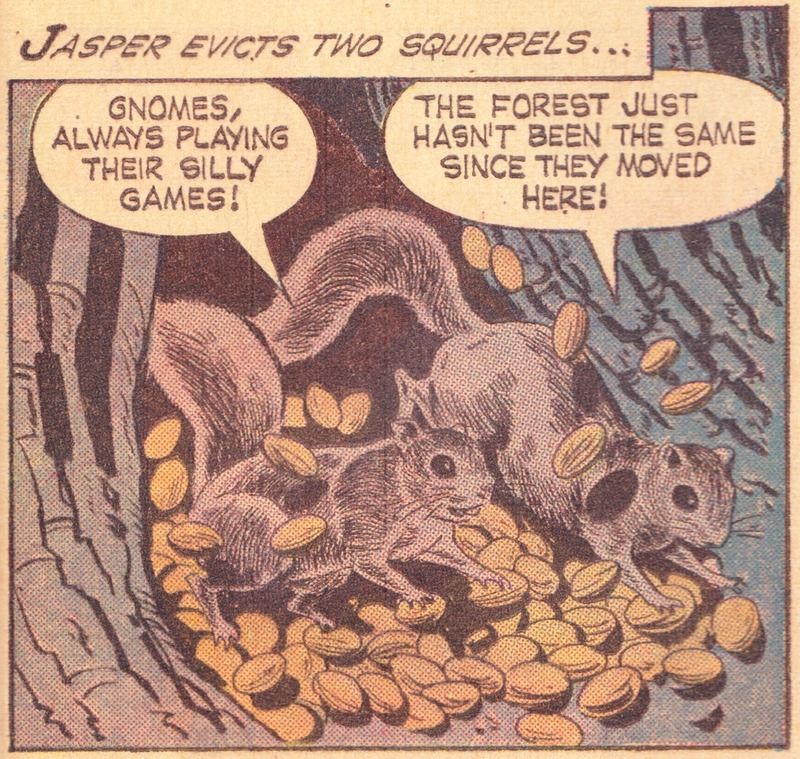 The comic book, also published in 1967, would seem to be a faithful adaptation of the movie, to the extent that it would ruin the whole thing if you read it before watching the movie. Maybe I'll track down and watch the movie some day, but, first, I'm itching for a double-feature rewatch of No Deposit, No Return and Candleshoe. 1. Sad side note: Garber died of pancreatitis in 1977 at age 21.